We did a short post on tending your social garden over on our Arizona SEO blog. Worth a read. While some may see time spent on social networks a waste, it really can be a productive endeavour. The name recognition, branding reinforcement, and personal connections you can make can prove valuable in tangible and intrinsic ways down the line. Tending your social garden in as important to business today as the trade show was 15 years ago. This entry was posted in Articles, Oblog, Web of Interest on November 15, 2007 by Joshua Strebel. A good friend of mine up in maple leaf country asked us to put together a sports blog for him.Â This is the type of site where wordpress really shines.Â A straight forward blog with multiple authors, basic navigation, and content sorted by team/author. 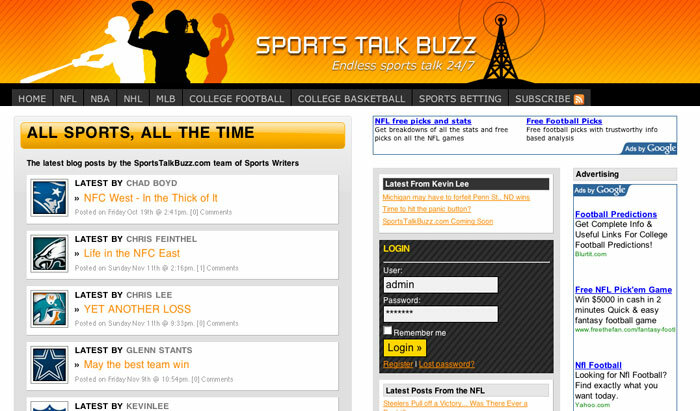 Be sure to follow sportstalkbuzz.com for all your sports blogging needs. Expect big things from this site very soon. This entry was posted in Oblog on November 13, 2007 by Joshua Strebel. The movie was awesome, but this post is about a milestone we reached with our party ideas and party planning website bestypartyever.com. As of today, 25 days since we launched the ALL new (v3) website, our 300th user just registered. The velocity of user sign-ups is increasing . I think it took over 15 days to get the first 100. While of course we are aiming for 100k users in the next few months, we’ll take the first 300 and be dang happy about it. Build it and they will come.. Um, No. Ponder this: How are people going to find your new website? When they get there, is there enough to keep them around? Will they tell their friends about it? Are you offering the user enough as a trade for their time investment in registering and providing contact/user information? How deep are your pockets for marketing and promotion? Are people talking about your new product or service. Is it buzzworthy? These are just a few of the many questions you should have answers for when contemplating a new website/community. We addressed many of these prior to launching the website. We already had great search engine rankings (learn about our search engine optimization services) for the v2 site which carried over and are improving. We have worked diligently to give the user some great tools and resources to make it worth their time to register. Sally did some interviews to get the word out, and we have leveraged other social networks (BPE on: MySpace, Facebook, Twitter, UstreamTV, Squidoo) to bring people into the fold. 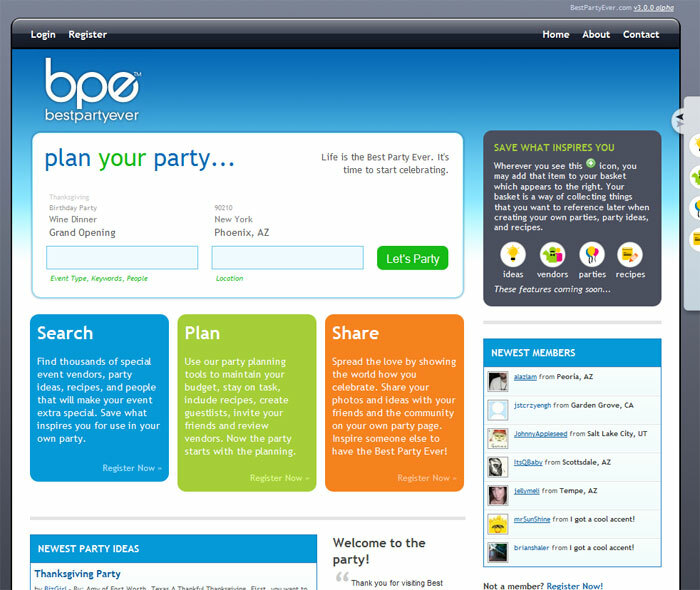 And finally we gave users of bestpartyever.com this simple option of inviting their friends. As an example I spoke with a potential client the other day about building them a new social utility, the $50k estimate for development I gave them did not seem to phase them, but the $50k in marketing/promotional budget I suggested for the first 6 months was met with silence on the other end of the phone. Wake up, this is what it takes folks. While the idea of bootstrapping a company from nothing to Internet stardom is valid, and has been done more than once, in practice the odds are not stacked in your favor. In the future we are planning more seamless integration into other websites and services to make it even easier for our users to interact and share. Your website is not (and should not be) an island. In todays marketplace: it MUST be connected. It has been a long few weeks with the launch and the frenetic pace of development. Sally and I are heading to Mexico for a few days, You are invited. This entry was posted in Articles, Oblog, Press, Web of Interest on October 25, 2007 by Joshua Strebel. Linda VandeVrede over at ValleyPRBlog.com shared her thoughts on Sally’s PR style. Sally is VP here at Obuweb, and Founder and CEO of BestPartyEver.com, a party planning social network. This entry was posted in Oblog, Press, Web of Interest on October 16, 2007 by Joshua Strebel. Yep!Â Spankin New Social network in 5 weeks, yeah we did it.Â We still have a quite a ways to go with the codebase and we are happy to announce the launch of the bestpartyever.com 3.0.0 alpha.Â This is a public alpha, as in a very stripped and minimal version released for public testing.Â Check it out. This entry was posted in Oblog on October 1, 2007 by Joshua Strebel. Dear Microsoft: We appreciate your prompt payment. Playing in the website design space is fun, but not always. If you are not a web designer than you probably know little about the work that goes into making a website “look” great. There are at least 5 major web browsers that the majority of people use. Microsoft’s Internet Explorer (6 and 7/Win) being the most common, Firefox (Win/Mac), and then finally Safari (Mac). Each one the browsers on each platform render a given website in different ways. What looks great in Safari may look terrible in IE 7. Rather then go into all the details of why and how, I am going to skip right to the point of this post. Web Designers spend hours, lots of additional hours working on websites that look great in all browsers, but look terrible in Internet Explorer 6. Unfortunately IE6 still commands a very large % of browser usage and therefore designers are forced to “hack” the code that looks great and renders “to standard” in other browsers. These hacks take time, and are necessary due to IE6’s non support of these official standards. Dear Users, PLEASE get a copy of Firefox or upgrade to IE7 (still crummy but better), your web experience will be greatly enhanced, we promise. Okay now really to the point. Microsoft, Pay up. It’s time to reimburse us for all the hours spent hacking flawless markup to make it work in your browser. 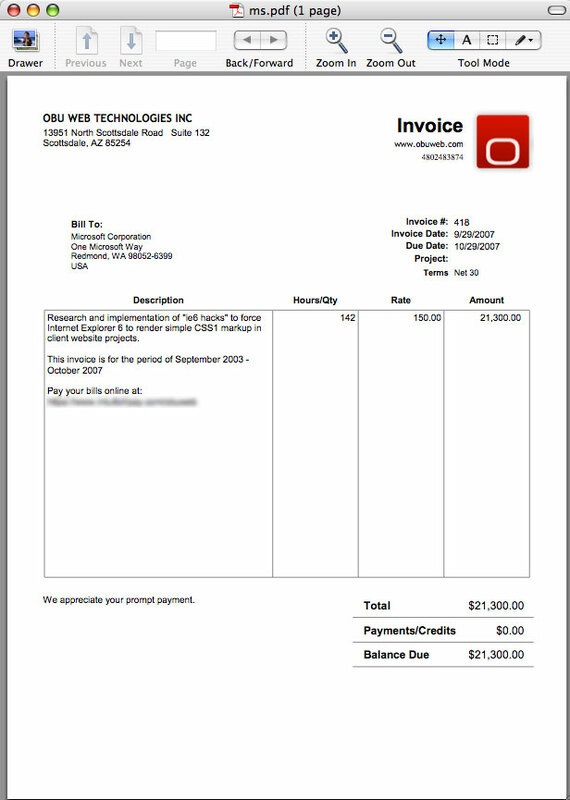 Here is the invoice for time spent by our staff over the last 5 years “fixing” compliant markup to render correctly in IE6. We appreciate your prompt payment. Thank you. This entry was posted in Articles, Oblog, Web of Interest on September 29, 2007 by Joshua Strebel. We have been tinkering on a few internal projects: web applications such as flare9.com and bestpartyever.com. We also have a few more in the works as well. The idea, and code is the easy part. Deploying the finished product to market is an entirey different beast. Launching your product or service is an ongoing process, not a 1 time event, as said to me by my friend and product launch consultant, David Daniels. We learned quite a bit about launching a product or service to market with David’s help, and we encourage everyone to check out his website and blog at http://launchclinic.com/blog. Yes we designed and host his website as barter for his services.. yet I would have happily paid through the nose for his valuable insight. We have a major release of bestpartyever.com coming up, and it makes it all the sweeter when you have the experts in your corner. Best of luck on your next endeavor. This entry was posted in Oblog, Web of Interest on September 2, 2007 by Joshua Strebel.